This 55-ton capacity ROGERS specialized lowboy features a 3 + 1 axle configuration to meet certain state weight law restrictions. The patented "No Foot"® gooseneck is designed to use low hydraulic pressures to lift the load without having to shift its position on the deck. The cambered drop side deck height can be as low as 15" in the normal ride condition. 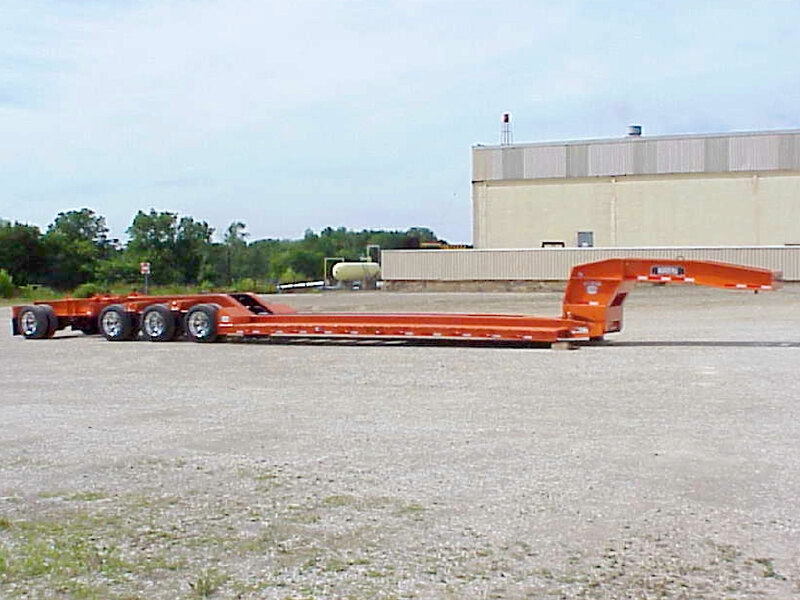 This booster axle assembly is designed so the trailing axle can be unpinned and connected directly to the trailer. The booster creates up to a 14'-1" spread between the center of the last rear axle and the trailing axle. Lowered cross members in the rear frame, the "boom trough," offer lower transport of large excavators. The drop side design has tread plate instead of wood for lower deck height. The special bridge ramps helps scrapers "climb" on to the rear frame. The booster axle assembly has a pivoting "knuckle" which enables the trailing axle to swivel for better maneuvering. The pivot point is close to the trailer to increase the turning radius and reduce tire scuffing. The toolbox in the deck with a lockable steel cover holds removable side brackets.